Can the renovation of a legendary train station propel Ford—and the Motor City—into the future? 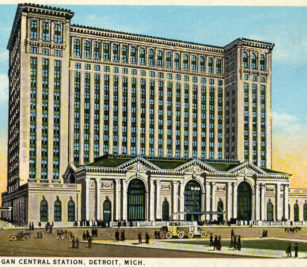 For about three-quarters of a century after it was built in 1912-1913 for the then-daunting sum of $2.5 million, Michigan Central Station, just west of downtown Detroit, was one of the grandest train stations in the nation. A hub of travel throughout the Midwest during World War I and World War II and the arrival point for thousands of immigrants to Detroit, the magnificent Beaux-Arts building also made a statement about the stature of the city itself. The rise of the automobile killed MCS. Train ridership began to decline in the 1950s; Amtrak took over the building in the ’70s, then closed it in 1988 and sold it to the Detroit-based Moroun family, transportation magnates who eventually shuttered the whole thing. For 30 years, the abandoned and dilapidated station served as a monument to urban decay, a painful reminder of the industrial grandeur that had once been the Motor City. But in June, Ford Motor confirmed a rumor that had been circulating for months: The nation’s second-largest automaker was buying MCS from the Morouns. 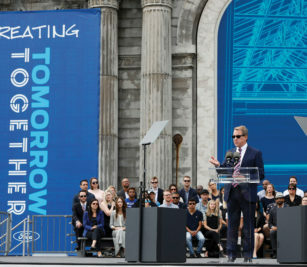 “It’s time to remake the station into a place of possibility again,” Ford executive chairman Bill Ford declared. The company plans to renovate and transform the 600,000-square-foot, 18-story structure into the anchor of a new downtown campus dedicated to “future mobility” and set to open in 2022. For 30 years, Michigan Central Station served as a monument to urban decay, a reminder of lost grandeur. For Ford, the project is a high-stakes gambit to attract and retain the human talent the automaker needs to compete in a future characterized by highly automated vehicles and an array of emergent digital services. The advent of enterprises like Uber, Tesla and Waymo, Google’s self-driving project, shows how Silicon Valley is challenging Ford, General Motors and the entire global auto industry for dominance in personal transportation. These outsiders contend that the strength of software, artificial intelligence and computing expertise, largely located outside Detroit, can beat the legacy automakers at their own game. But some observers caution not to count Ford out. “Bill Ford has had a long-standing vision for the future of mobility, one that is driverless, sustainable and dominated by services,” says Sam Abuelsamid, a senior research analyst for Navigant Research, which analyzes cleantech markets. “He has been looking at the societal impact of automobiles and the way society is changing, and asking, ‘How does Ford fit in, and how do we move people in the future?’” That vision will help determine Detroit’s future. The challenge for Ford and other incumbent manufacturers has been this: While the tech boom made other parts of the country hip, Detroit was broke. As a result, the car companies have struggled to attract young graduates in high-tech fields. That’s starting to change as Detroit’s revival, especially downtown, has imbued the city with a new aura of cool. Ford says it will station about 2,500 workers, roughly 5 percent of its workforce, at its new downtown campus, centered around MCS. Most of these employees will be engineers and specialists in self-driving technology, mobility services and vehicle electrification. The automaker’s headquarters and other technical departments will remain in Dearborn, a city of 100,000 that borders Detroit. “Our goal is to create an ecosystem of partners, startups and companies that help drive mobility initiatives,” says Dave Dubensky, chairman and CEO of Ford’s Ford Land real estate subsidiary. “The urban nature of where we are going, the mixed use of office, retail and residential components, and our intention of integrating into the community all contribute to this value proposition.” Helping to guide Ford’s project is Craig Dykers of SnØhetta, an architectural design firm with headquarters in Oslo and New York responsible for the 9/11 Memorial in Manhattan, the Oslo Opera House and the San Francisco Museum of Modern Art. Ford will station roughly 5 percent of its workforce at its new downtown campus around MCS. By most accounts Ford has lagged behind competitors in research and activities related to future mobility. Toward the end of 2015, the automaker appeared poised to sign a partnership with Mountain View, Calif.-based Waymo that might have boosted its prospects for developing self-driving technology. But in January 2016, Waymo backed out of the talks for undisclosed reasons. Two months later, Jim Hackett, a Ford director, stepped down from the board to take over leadership of Ford’s Smart Mobility activities, an early sign the automaker knew it was falling behind and had to double-down. At about the same time, Ford acquired Pittsburgh-based driverless startup Argo AI and promised to invest $1 billion in the tiny artificial intelligence company. In May 2017, Hackett, 63, a former CEO of office furniture maker Steelcase who has deep connections to Silicon Valley, was named Ford’s CEO, replacing Mark Fields, who had spearheaded the failed Waymo negotiations. Hackett quickly announced an increase in investment spending on vehicle electrification and a shakeup of Ford’s portfolio of conventional vehicle models. Several slow-selling car models, such as the Ford Fusion sedan, are being dropped, while plans are underway for new crossovers. Ford, which has so far developed just two gas-electric hybrids, now says that it will offer 16 battery-powered models globally by 2022. Hackett also revisited Fields’ decision to spend $1 billion to renovate Ford’s technical campus in Dearborn. Instead, the automaker decided that a downtown location was crucial for attracting young talent. MCS provided that—along with a powerful statement about Ford’s commitment to Detroit. 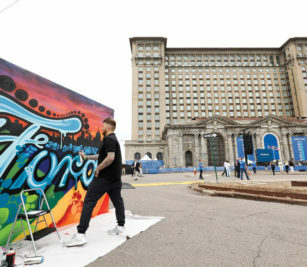 Corktown, the neighborhood where MCS is situated, represents “a blank canvas, a place to try new ideas and a new kind of work environment to attract the people Ford needs,” says Abuelsamid. It’s the city’s oldest neighborhood, named after Cork County, Ireland, the place from which many of its original inhabitants came. Like many parts of Detroit, Corktown was devastated by poor urban planning, racial strife and white flight. In the past few years, it’s rebounded, thanks to the arrival of a technology center from Quicken, as well as a Detroit Police Athletic League facility, residential development and a new hotel. And, with its blend of narrow alleys, streets, highways and varied structures, Corktown offers an ideal environment to conduct future mobility research and testing. Ford’s initiative isn’t the first high-tech foray in Detroit’s rebirth. From its status as one of the richest cities in the world during the 1960s, created by the oligopoly of GM, Ford and Chrysler, Detroit plunged into poverty and racial conflict through the 1990s after its supremacy in automobiles collapsed. The Great Recession further battered the city’s economy, and many in the middle class fled. Revival attempts largely sputtered until 2009, when Quicken announced that it was relocating its suburban headquarters from Livonia, Mich., to downtown. Led by Gilbert, a billionaire who grew up just outside the city—his father owned a bar in Detroit—Quicken initially moved 1,700 workers there, a number that has grown to more than 17,000. The activities and vision of Quicken’s Gilbert have been largely responsible for the stunning acceleration of the local economy. Though known as an online originator of mortgages, Quicken considers itself a tech company that specializes in mortgages while investing in tech startups, mostly Detroit-based. Additionally, Quicken, through its Bedrock subsidiary, has invested more than $5.6 billion buying and rehabbing more than 100 properties in downtown Detroit and Cleveland. Bedrock’s portfolio now includes more than 330 retail and office tenants in downtown Detroit. “What Gilbert and his team have done downtown is outstanding,” says Ford’s Dubensky. “Many Ford employees now say they want to live downtown. The area has become a great environment to live, work and play in. We think we can do the same with Corktown.” If they succeed, it’ll be another watershed in the ongoing revival of a great American city.